Graduate candidate can apply for Railway Job in Assam 2017. This vacancy is advertised by SOUTHWESTERN RAILWAY RAILWAY RECRUITMENT CELL for various posts under Indian Railway for eligible and interested candidates. If you are interested in Central Govt. Job then apply on or before 3.10.2017. Please read this article till the end to know details eligibility criteria, application process and selection process for the Railway job. 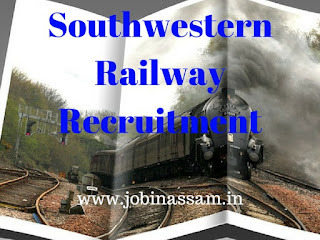 Railway Recruitment Cell, South Western Railway has released a recruitment notification for 136 posts of 136 Goods Guard. Interested candidates may check the eligibility criteria and apply online from 08-09-2017 to 03-10-2017. Go to RRC/SWR website www.rrchubli.in. Click on Goods Guard- General Departmental Competitive Examination (GDCE) - Online application. Click on the “New Registration” Link available in the home page. Fill up the basic details viz. Name, Date of Birth, e-mail Address, Aadhaar No. and Mobile number etc. Follow the instructions and complete the registration process step-by-step for generating a Registration Number & Password for login. Candidates are advised to preserve/note their Registration ID and Password generated and sent to their Email ID & SMS to the registered mobile number for further stages of selection process/correspondence with respective Hqrs., Divisions/Units concerned. Selection of candidates will be made on the basis of Computer-Based Written Examination and Medical Exam.